I know what you're thinking - such a 'many tools in one app' is a staple of phone and PDA software since the dawn of time - the tools are often trivial and easy to write, which is why this genre keeps re-appearing. Except that Perfect Software's version has had an unusual amount of time invested in its various tools/utility. Enough for a full review here - you'll thank me later. There are two ways to explore Perfect Tools' offerings. 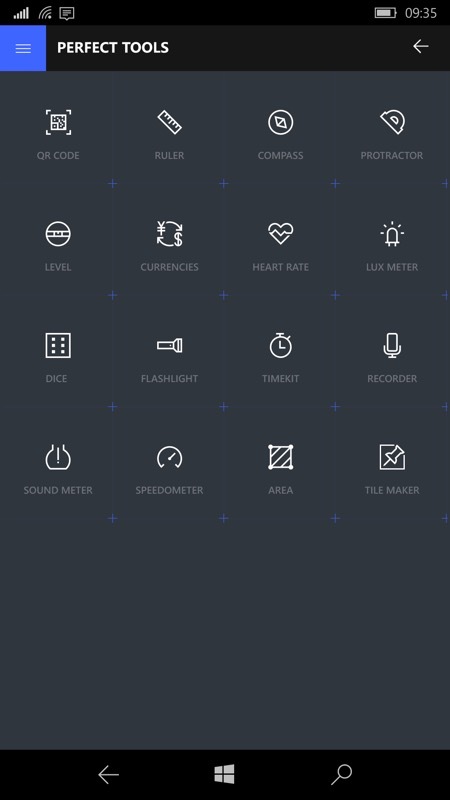 A slide-out full page of icons or a traditional pop-up (and swipeable) hamburger menu - it's up to you, though note that the latter also includes shortcuts to Perfect Flashlight and Perfect Recorder, among other Perfect Software offerings. 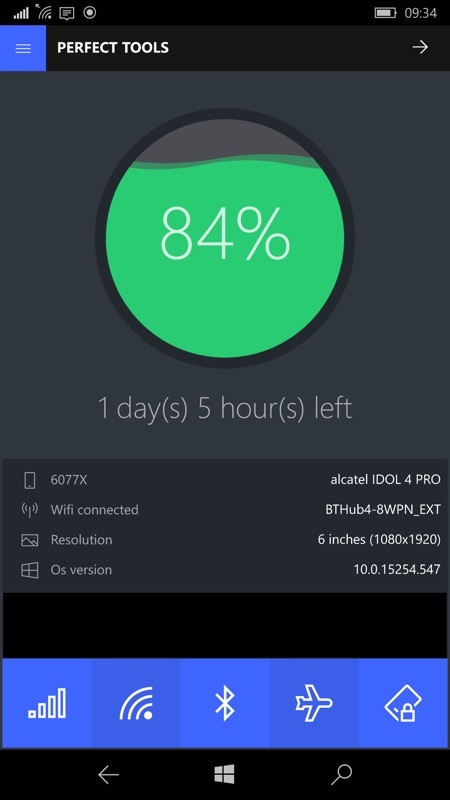 They're all pretty good, mind you, this is no bloatware system. 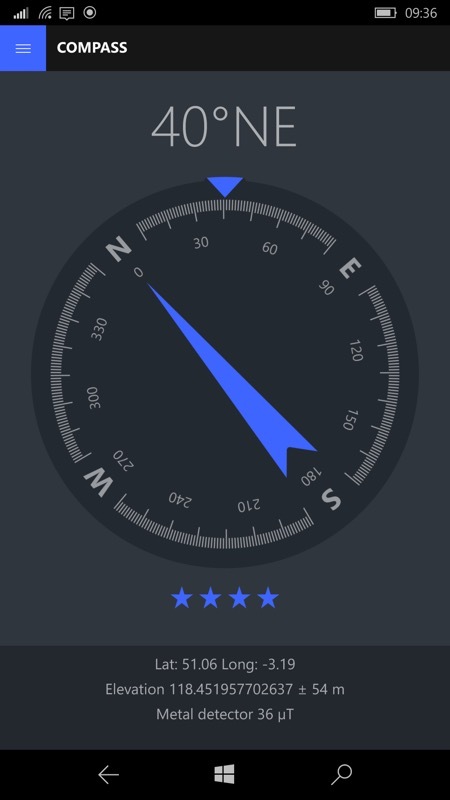 The dark theme throughout and the detailed compass rose give an elegant air. The magnetic signal strength is included too. Admittedly most of us never need direction this accurately in the modern age, but hey, one day you'll be stuck on the moors somewhere and this may help a lot? Next up is a protractor, a staple instrument when I was at school - do they still use these? The idea is that you overlay something on top of your phone screen, get the apex right and then drag the touch handles until the angles match your object. 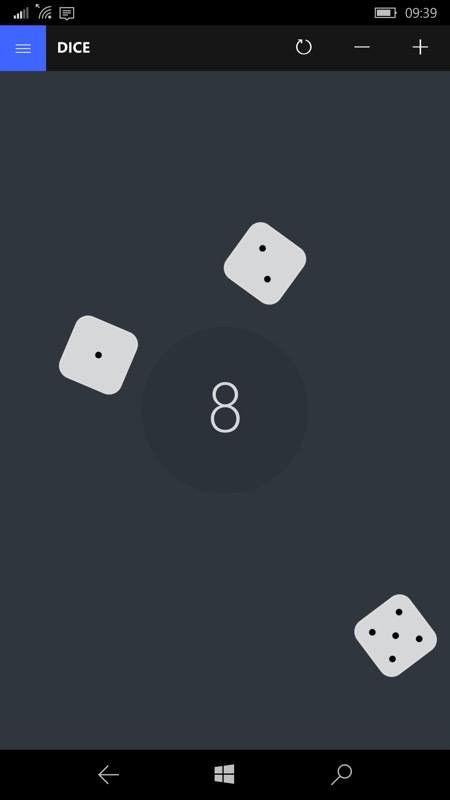 Hey presto, the difference in subtended angle is displayed! Note also the little camera icon, top right - this lets you measure the angle of something that can't be moved or placed on the screen. So you line up by eye with the camera's view, and so on. It's very well done. 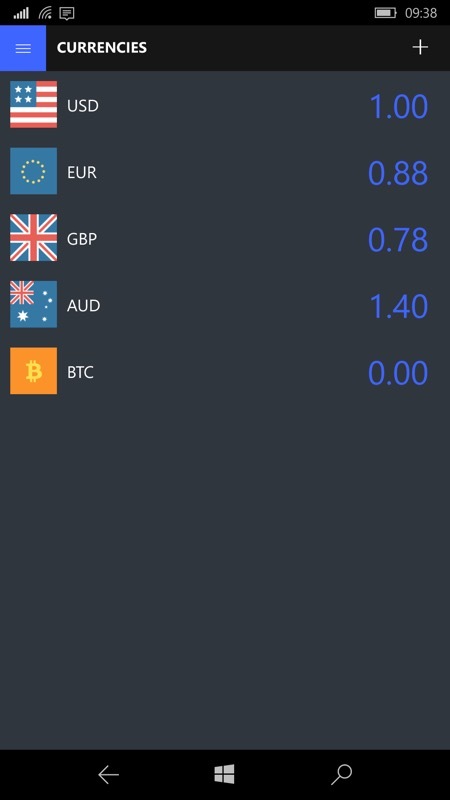 Currency calculation are a staple of utility compilations and they're here too, just tap on any number to change it and all the other values change in real time. Health is a big focus in the tech world at the moment, and though Perfect Tools can't auto-magically add a heart rate sensor to your Lumia, the idea is that by tapping to your heart beat (for example with a finger placed over the other wrist), your rate can be pretty accurately determined, with averaging and correction for entry errors - the longer you tap for, the more accurate the reading. 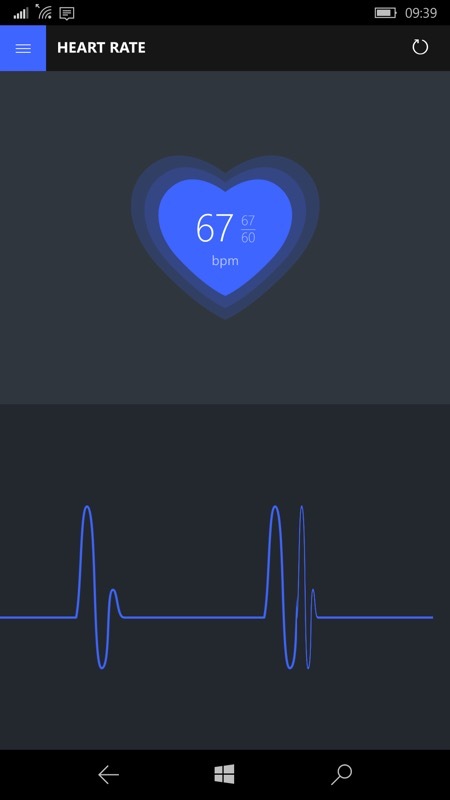 Animations and a mock cardiograph help keep this tool easy and enjoyable. 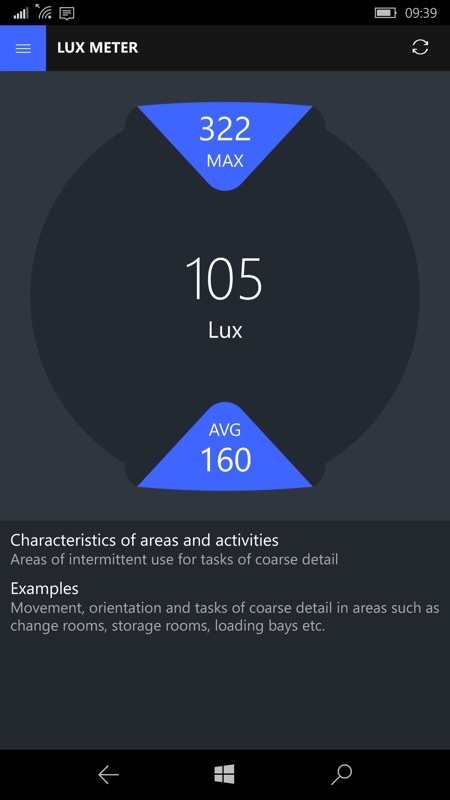 The Lux Meter (i.e. light meter) is similarly well done just point the phone's front (with the ambient light sensor) in any direction and light readings are shown in real time, with maximum and average calculated - the wording here seems to indicate that you could set this up running on a phone on a stand and it would monitor levels and use, e.g. in a room. Interesting! I'll include one more example, though there's more here that you'll want to discover for yourself. 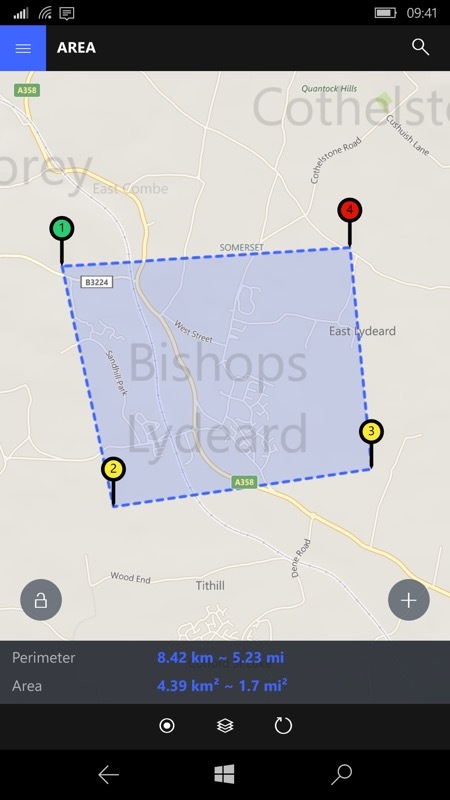 'Area' is a splendid little mapping tool, using end points that you specify over the top of data from Windows 10 Maps. 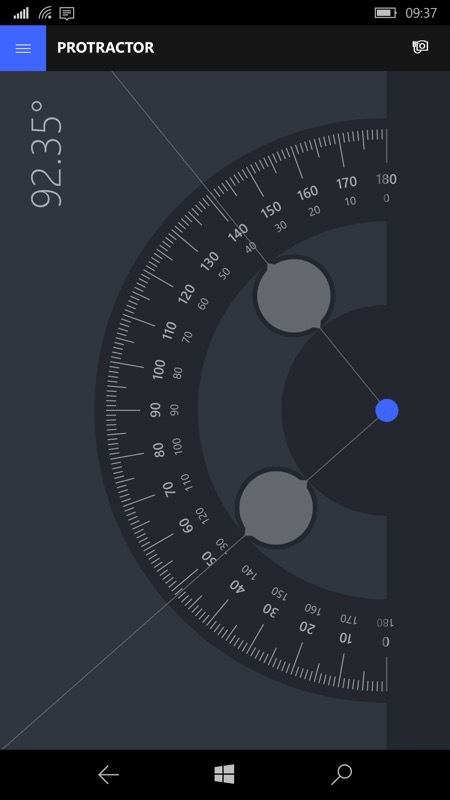 In other words, pan and zoom as needed and then start tapping to select any area with more than three vertices, you don't have to stick to regular shapes. Perfect Tools then calculates the perimeter and area in km and miles as you go. You can even drag the vertices around after the fact, to see the effect this has on area. Very neatly done indeed. You'll have got the idea by now. 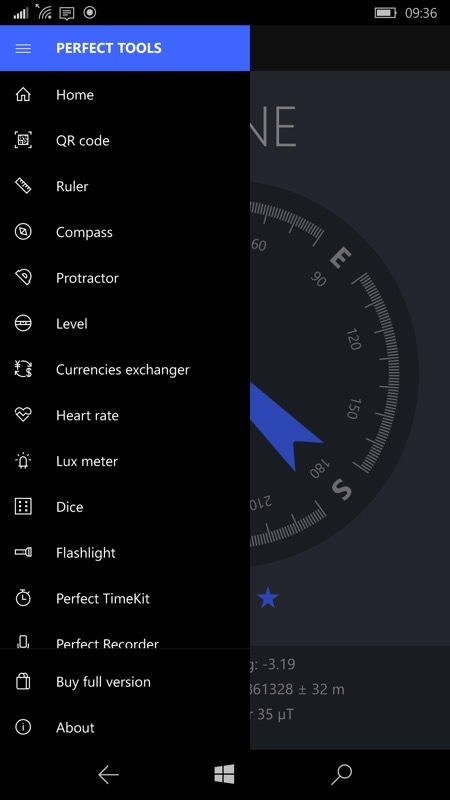 Perfect Tools goes the extra mile in terms of developer effort to create genuinely useful mini-apps. After a few uses of this free-to-download tool, you'll start to get plagued with intern adverts for the developer's own applications, but this is fine - just pay the couple of quid in the In-App-Purchase and then you're good to go (and the developer gets paid).